The First Catholic Slovak Ladies Association is proud to announce the selection of Elaine Walters of Neshanic Station, NJ as our association's 2010 Fraternalist of the Year. Her profile has been sent to the National Fraternal Congress of America (NFCA) to be considered for national recognition. The 2010 NFCA Fraternalist of the Year will be announced and honored at the 124th Annual Meeting to be held in Chicago, IL from September 9-11, 2010. 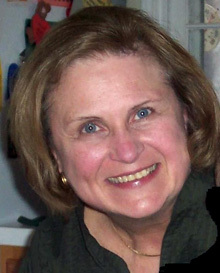 Elaine is a widow and has been retired since 2007 from a 33 year career as a School Media Specialist. She has 2 children and 2 grandchildren. Her current positions are President and Financial Secretary of Branch S-35/J-67 in Raritan, NJ. She took over the responsibility of these branches when her mother Helen Koval passed away in 2009. She has served her branch as an office for over ten years. Elaine is very diligent in representing her branch. In her duties as branch secretary she answers all requests from the Home Office promptly. She has participated in many of the fraternal contests and challenges that are introduced in our magazine. She has encouraged her branch members to get involved in all FCSLA sponsored activities. Her junior branch is planning a Matching Funds Project to raise funds for St. Joseph's Church Children's Choir. The church is in need of a new piano. She also encourages members to volunteer in their church and community. Many of her branch members belong to the St. Joseph's Parish Senior Group. She keeps them informed of the social events and special programs. Where does Elaine volunteer? The list is very long of all the ways she volunteers at her home parish, St. Joseph's Church in Raritan, NJ. She devotes her time to many of their projects, committees, and fund raisers. She volunteers for 40 hours every season at the Community Theatre located in Branchburg, NJ. She is a "Sunshine" visitor at a nursing home, craft helper at an Assisted Living Senior Center and book helper at the public library. She makes rosaries from the beads that are produced from a plant she raises and donates them to patients at a local hospital. Elaine, at every opportunity encourages adults to work with the youth in her branch, church and community. She acknowledges the contributions young people make on every occasion. She supports their efforts and praises them. Elaine knows that our youth is our future as she tries to instill pride in future generations. We congratulate Elaine Walters for receiving this well deserved recognition. She is an excellent example of a true fraternalist in every sense of the word. She has made a difference in her branch, church and community. The world is a better place because of Elaine and the many other fraternalists who are dedicated just like her. Learn more about FCSLA in the Community.